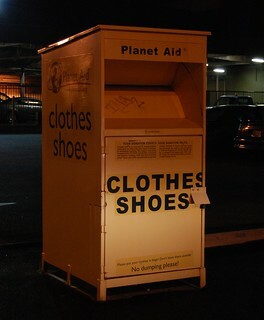 I am really curious about the blue metal containers that say 'CLOTHES AND SHOES' that are found around the city. Who operates these containers and where do the donations go? There are even some green containers bearing the 'Gaia Movement,' which I thought folded years ago. WBEZ did a story some time ago about the 'Books for Charity' containers and how the donations were going to a for-profit business. Maybe that is the case with these boxes. Thanks!